The last step in setting up Standard Edition software is to go live so your customers can start shopping. DO NOT GO LIVE UNTIL YOUR INTEGRATION IS COMPLETE AND YOUR CARTLINKS ARE IN PLACE ON YOUR WEB SITE! The only thing that changes when you go "live" with the software is that credit card processor test mode limitations are removed. There are no additional features or functionality that are added, only the removal of this limit. Please do not complete this step until you are completely ready to sell your products online. Sign in to the administrator and click the "Manage Applications" icon in the Account Administration panel. On the next page, check the checkbox next to CustomCart and click the "Go Live" button. 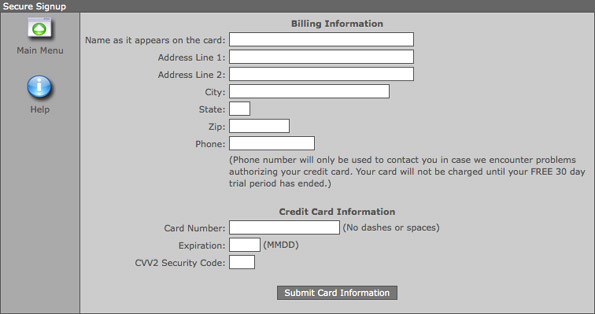 When you have entered all of the requested information, click the "Submit Card Information" button. You have successfully completed integrating your web site with our shopping cart software and it is now in "Live" mode!